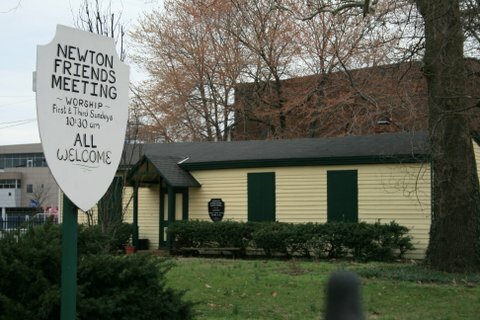 Newton Friends Meeting is a Quaker community in Camden, New Jersey, dating from 1679. The Meeting has a long tradition of service to the people of Camden. We are a small group that gathers for worship every Sunday. Our property comprises most of a city block and supports two lush gardens and play space. Quakers are members of the Religious Society of Friends, a faith that emerged as a new Christian denomination in England during a period of religious turmoil in the mid-1600’s and is practiced today in a variety of forms around the world. “Quaker”and “Friend” mean the same thing. The Society of Friends grew out of the mystical journey of the Englishman, George Fox, in seeking a way to serve God without the “steeplehouses” and the often abusive formal religious structure present in the mid-Seventeenth Century. His work came out of the same radical protestant movement that led to Cromwell’s toppling of the English monarchy, and also ultimately led to the Baptists, Separatists, and Puritan reformers in the Church of England. Worship is based on silent seeking for the Inner Light in a communal setting. Friends have no formal creed. In practice they have been notable for their stress on plain clothing, speech, and refusal to acknowledge rank. The basic unit of organization is local, the Monthly Meeting, which includes the monthly meeting for business where decisions are made by consensus – that is when no one remains strongly opposed. Groups of Monthly Meetings are organized into Quarterly Meetings (eg. Haddonfield, Burlington) which meet every three months; these in turn are organized into a Yearly Meeting which is the overall administrative and organizational unit for a large area (for example; Philadelphia, New York, Baltimore). Meetings such as ours, generally along the East Coast, are called Unprogrammed meetings reflecting the type of worship. In the course of western settlement, with great distances and resulting problems in corporate decision making, a type of Programmed Meeting developed with ministers and a more evangelical orientation. We continue our traditional testimonies of pacifism, social equality, integrity, and simplicity, which we interpret and express in a variety of ways, including stewardship of our planet. Quakers are not: Amish, Anabaptists, Shakers or Puritans–we come from a separate tradition than these other groups. Religious Society of Friends (Quakers) The Newton meetinghouse is the sole remaining structure in the City of Camden representative of the early settlers of this region. Even before the settlement of Philadelphia in 1686 Friends were involved with what was then called West Jersey, starting in Salem in 1675. Coming from England, William Cooper, settled at Pyne Point in 1680. He and other Quakers who had settled further south on Newton Creek (by the Walt Whitman Bridge) worshipped with Friends who had settled at Shackamaxon on the Pennsylvania side. With the arrival of William Penn the Pennsylvania Quakers were gathered into meetings on their side and New Jersey Friends formerly established Newton Meeting in 1682. The first meetinghouse was built on Newton Creek, in what would now be West Collingswood, in 1684. It was a log building, burned in an inter-meeting squabble in 1817. However, by that time a new brick meetinghouse had been built on Mount Ephraim Avenue in Camden (near Mt. Vernon Street) in 1801. This building survived until about 1950 and the graveyard still remains on open land near the Salvation Army Building. It was in this building that the great schism of Friends occurred with a physical division of the meeting between Orthodox and so-called Hicksites. In Camden the Orthodox seized the meetinghouse (those who stayed varied from meeting to meeting) and the Hicksites ultimately built the beginnings of our current facility as “a little cabin in the woods”. This structure dated from 1827 and constitutes about two-thirds of the current meetinghouse. About 1850 a one room school building was added adjoining the meetinghouse and the school was enlarged about 1870. In 1885, in an effort to add creature comfort and modernize the Greek Revival meetinghouse, the Philadelphia architect, Wilson Eyre, designed additions which included a fireplace (with a furnace below), an entrance vestibule, and a small library wing. The attic was also removed and tie rods inserted to enlarge the space. Thus, was created perhaps the only American Queen Revival Meetinghouse in the country. In the 1950’s, following many years of planning, the meetinghouse and the school house (now called the Guild House) were moved toward the east to allow the passage of the Haddon Avenue extension. Several years later the Newton Community Center was established.